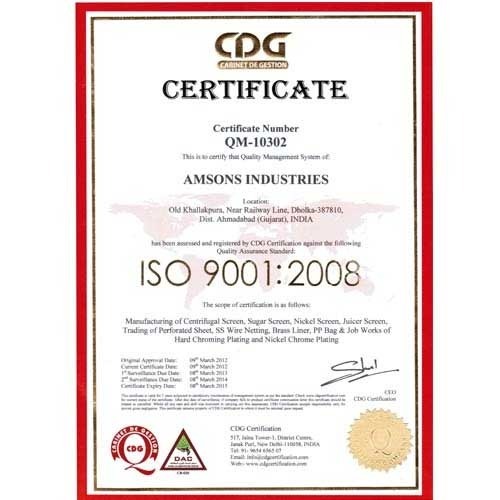 Established in the year 2000, Amsons Industries is involved in manufacturing, supplying, importing and exporting an extensive range of Electroformed Nickel Screens, Centrifugal Nickel Screen, Electroformed Nickel Screen, Continuous Centrifugal Screen, PP Bags, Centrifugal Brass Liner and Nickel Perforated Rotary Screens. These products are widely known for their extensive features such as ductility, corrosion & wear resistance, smooth surface and temperature resistance. Our products are widely used in Sugar, Pharmaceuticals, Paint, Food, Textile, Engineering and Automobile industries. Further, our rich experience has enabled us in undertaking the job-work of Electroless Nickel, Electropolishing, Bright Nickel Chrome and Hard chrome plating works. Our state-of-the-art manufacturing facility is equipped with technologically advanced machinery enabling us in the effective production of a peerless product range. We have employed an efficient team of professionals, which has sound experience and holds domain expertise in this field. These professionals strive hard to meet the client's requirements in an efficient manner. Our vast client-base is spread across the globe especially in Asian, Gulf, Middle East & African Countries. Under the able guidance of our mentor Mr. M. Radhanpuri we have emerged as a reputed firm in the domestic and international markets. He has extensive and thorough industry experience of more than a decade in the filed of nickel electroforming and several electroplating techniques. Further, he had put in special efforts to develop and establish good aspects of nickel-hard chrome plated screen. This screen finds application in high-speed centrifugal machine, which is widely used in sugar manufacturing industry. Our organization has established a strong foothold in the market with its diversified products and services. We are catering to the requirements of various industries. Our clients appreciate our products for their extensive features. We are assisted by a diligent team of professionals, who have sound experience and high qualifications in their respective fields. Our well coordinated and talented team of professionals is engaged in contributing in the production of a peerless product range as per the international standards. We are also providing customized solution of our complete product range with the help of our engineers. Owing to the sincere efforts and dedication of our professionals, we have been able to achieve an enviable position in the global market. We have carved a niche in the domestic and international markets due to our flawless products and excellent services. Our clients have deep faith in us and appreciate our client-centric approach & ethical business practices.